This cruise was a celebration of successful medical treatments. We wanted to get away and be together after a great deal of anxiety. Also, we wanted to be close to the USA. The timing, location and length of this cruise satisfied our needs. Our experience exceeded our expectations that were high because of Viking&apos;s excellent reputation. From the moment of our Viking greeting after arrival at the airport in Montreal until our departure we felt comfortable with the happy, friendly and professional crew. Our cabin was roomy, comfortable and well appointed. Meals were excellent and service was superior. The dining services team were attentive, caring and empowered. The no charge for beverages was a plus even though our personal limits are one-two. Tours were well organized and added value to our experience. Lectures were excellent and presented by exceptionally well qualified professionals in their field. We were drawn to the lectures on Art, presented by a PHD from the Edinburgh, Scotland Art Institute. 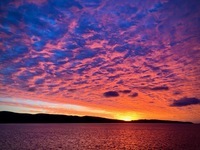 Sunrise near Gaspe, Canada, on St. Lawrence River. 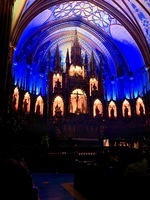 Notre Dame Cathedral altar prior to the Aura Light Show. 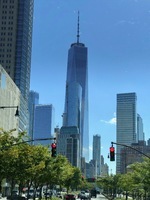 The Freedom Tower, Manhattan, NYC during bus and boat tour. This cruise was a celebration of successful medical treatments. We wanted to get away and be together after a great deal of anxiety. Also, we wanted to be close to the USA. The timing, location and length of this cruise satisfied our needs. Our experience exceeded our expectations that were high because of Viking&apos;s excellent reputation. From the moment of our Viking greeting after arrival at the airport in Montreal until our departure we felt comfortable with the happy, friendly and professional crew. Our cabin was roomy, comfortable and well appointed. Meals were excellent and service was superior. The dining services team were attentive, caring and empowered. The no charge for beverages was a plus even though our personal limits are one-two. Tours were well organized and added value to our experience. Lectures were excellent and presented by exceptionally well qualified professionals in their field. We were drawn to the lectures on Art, presented by a PHD from the Edinburgh, Scotland Art Institute. Our cabin was roomy, well appointed and comfortable. My spouse is sensitive to back issues from sleeping; and she had no problems. The quality of the room service breakfasts were excellent. Tour guide was excellent, especially since he lived at the the Cape and had been a commuter during his career in Boston. Weather did not permit a cruise on the canal. We appreciated the concern for our safety. Tour guide was knowledgeable and shared knowledge well. We learned the importance of Halifax during WWII; and for the rescue efforts after the Titanic sunk.